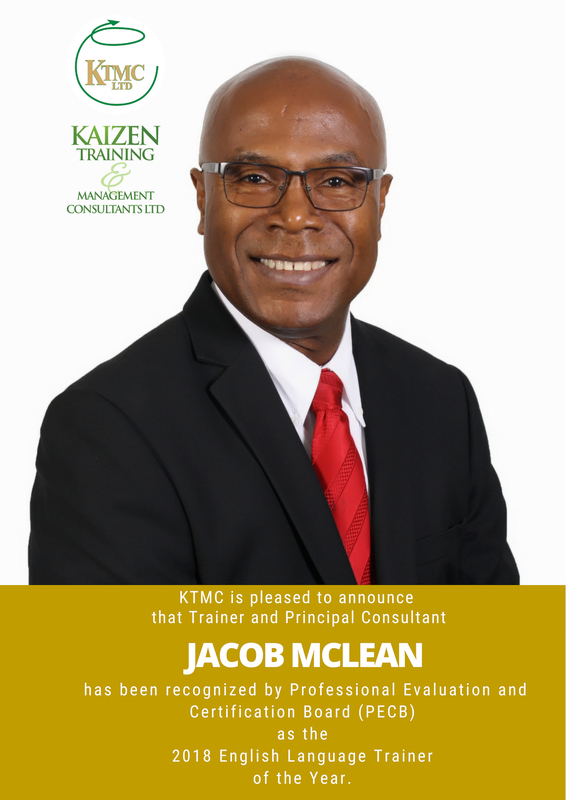 Kaizen Training and Management Consultants (KTMC) is pleased to announce that Trainer and Principal Consultant, Jacob McLean, has been recognized by Professional Evaluation and Certification Board (PECB) as the 2018 English Language Trainer of the Year. The criteria for the award are excellence in training as well as participants’ feedback and examination success rate. PECB, which is accredited by the IAS against ISO/IEC 17024, ISO/IEC 17021 and ISO/IEC 170265, is a unique provider of the best management systems training through its global network of trainers and re-sellers. As well as being a PECB Certified Trainer, Jacob is a Certified Environmental Health and Safety Trainer with the Board of Certified Safety Professionals (BCSP), a CSP, QEP and member of ASSP and ASQ. He is certified or qualified and widely experienced in the courses that KTMC offers. He is a dedicated trainer who exhibits empathy, is knowledgeable and experienced in a wide range of management systems, having worked for major multi-nationals and several blue-chip Jamaican companies. KTMC invites individuals, companies/businesses/organizations to make it the solution centre for all training and management systems consulting needs. We guarantee excellence in quality, service and delivery.